Wärtsilä's fourth quarter order intake increased by 9% to EUR 1,357 million (1,250). In relation to the previous quarter, Wärtsilä's order intake increased by 6% (EUR 1,275 million in the third quarter of 2012). The book-to-bill ratio for the fourth quarter was 0.89 (1.01). The order intake for Power Plants in the fourth quarter totalled EUR 471 million (464), which was stable compared to the corresponding period last year, and 4% higher than in the previous quarter (EUR 453 million in the third quarter of 2012). During the fourth quarter, Wärtsilä received significant power plant orders from Brazil, Mauritania, Mozambique and the USA. The ability to deliver a broad range of different sizes of power plants for many types of applications demonstrates the strengths of Wärtsilä's Smart Power Generation concept. The fourth quarter order intake for Ship Power totalled EUR 339 million (324), an increase of 5% over the corresponding period last year. Compared to the previous quarter order intake decreased by 13% (EUR 391 million in the third quarter of 2012). During the quarter, order activity was highest in the Offshore segment. Wärtsilä's major offshore related orders included an order to supply complete mechanical packages for three new drillships to be built by a Brazilian shipyard, an integrated solution for an LNG powered platform supply vessel to be built in Norway, and yet another contract to supply a complete LNG package for an offshore support vessel to operate in the Gulf of Mexico. Wärtsilä was also awarded the contract to supply integrated power and automation systems for two new Russian icebreakers, as well as a contract to supply propulsion machinery and gas storage and handling systems for the first passenger ferry in Canada to operate on LNG. During the quarter, Wärtsilä received an order to supply the complete dual-fuel propulsion package for two new gas tankers being built for a Dutch customer. The Offshore segment represented 44% of the fourth quarter order intake, while the Merchant segment share was 28% and Special Vessels 15%. The Cruise & Ferry segment's share of order intake was 11% and Navy accounted for 1%. The order intake for Services in the fourth quarter totalled EUR 543 million (459) which was 18% higher than for the corresponding period last year. 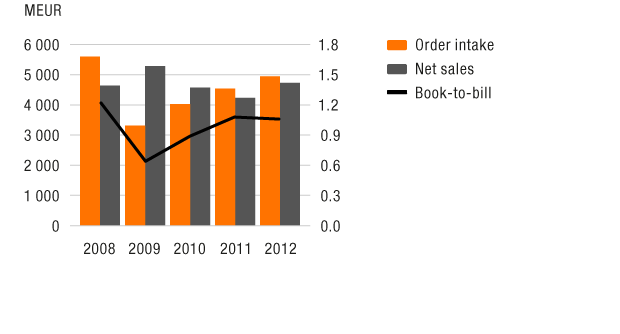 Compared to the previous quarter, order intake increased by 27% (EUR 428 million in the third quarter of 2012). During the fourth quarter, Wärtsilä signed a 15-year parts supply agreement and a 5-year technical service agreement with KEPCO Plant Service & Engineering Co. Ltd, covering Amman Asia Electric Power's 573 MW power plant being built in Jordan. Wärtsilä also signed a maintenance agreement with South Texas Electric Cooperative in the USA, a four year extension to its operations & maintenance agreement with Guyana Power & Light, Inc., and an extension of three years to an operations & maintenance agreement with United Cement Company of Nigeria Ltd.
Wärtsilä's order intake for the review period January-December 2012 totalled EUR 4,940 million (4,516), an increase of 9%. The book-to-bill ratio for the review period was 1.05 (1.07). 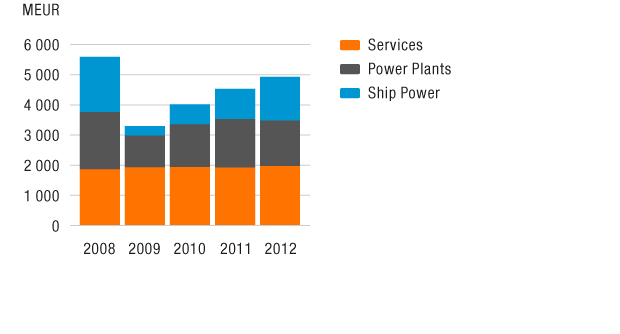 For the review period January-December 2012, the Power Plants order intake totalled EUR 1,515 million (1,602). Compared to the previous year, this represents a 5% decrease, while the total market is estimated to have decreased by 30-40%. Around 74% of the orders received, in terms of MW's, were from gas based markets. In 2012, Wärtsilä received its largest ever power plant order for a 573 MW tri-fuel project in Jordan. 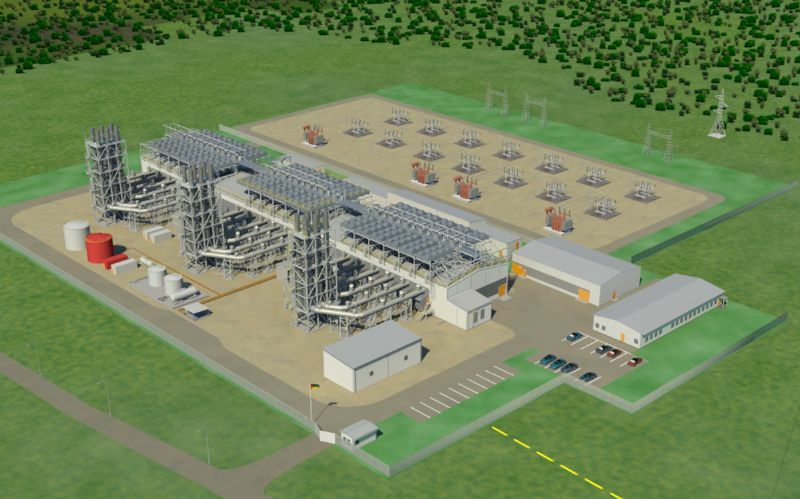 Another major order was received from Azerbaijan, for a 384 MW plant operating on gas. In addition to the fourth quarter orders, other important orders were received from Indonesia, Australia and the USA during 2012. 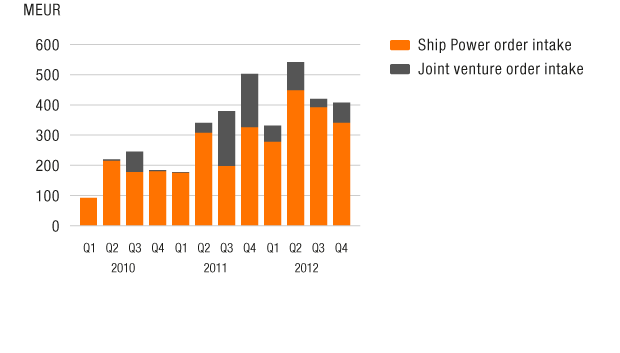 Wärtsilä Ship Power's order intake for January-December 2012 was EUR 1,453 million (1,000), an increase of 45% over the corresponding period last year. Throughout 2012, there was good order activity in the Offshore and Special Vessels segments. In line with the Ship Power strategy, Wärtsilä received several significant orders for the delivery of total solutions, including ship design, propulsion machinery, automation and other equipment as well as several orders for environmental solutions, such as exhaust gas cleaning systems for SOx removal and the first orders for ballast water management systems. In the Offshore segment, major orders included those for nine drillships and six pipe laying vessels related to the ongoing Brazilian offshore programme, and for several platform support vessels. Wärtsilä received many orders for dual-fuel engines, underlining the company's frontrunner position in gas applications. Dual-fuel equipment will be delivered among others for a Canadian passenger ferry, for two gas tankers to be built for a Dutch shipping company, for two Chinese tug boats, for a dry cargo inland waterway vessel to operate in Europe, for a guideship ordered by the Korean port authority, as well as for three offshore support vessels to operate in the Gulf of Mexico. The Offshore segment represented 46% of the total order intake, while the Merchant segment share was 28% and Special Vessels 12%. The Cruise & Ferry segment's share was 6% and Navy represented 7% of the order intake. Other orders accounted for 1%. For the review period January-December 2012, the Services order intake totalled EUR 1,961 million (1,909). During the review period, Wärtsilä signed major Operations & Maintenance agreements for power plants in Kenya, Timor-Leste, South Africa and Brazil. Wärtsilä was also awarded service agreements by Princess Cruise Lines Ltd, and by Prestige Cruise Holdings, Inc.
Order intake in the Wärtsilä Hyundai Engine Company Ltd joint venture company in South Korea, and the Wärtsilä Qiyao Diesel Company Ltd joint venture company in China, producing auxiliary engines, totalled EUR 242 million (394) during the review period January-December 2012. Wärtsilä's share of ownership in these companies is 50%, and the results are reported as a share of result of associates and joint ventures.